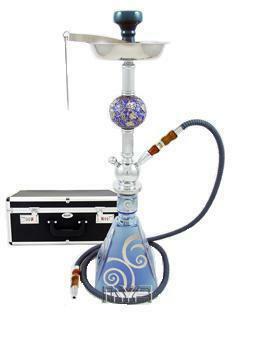 The Pinnacle is a 26 inch hookah from Mya Saray. It encompasses a fully unique Bohemian vase (DESIGNS MAY VARY) and a gorgeous, detailed Cloisonne stem. There are many color options to choose from, but all will maintain this delicate detailing. The stem contains a subtle, nature inspired pattern that is enough to pull in and enchant the user. The Pinnacle may easily be converted into a 2 hose hookah with the help from a single Mya stem adapter that can be purchased separately. It also comes with the added feature of the Auto Seal System, effectively eliminating the need for rubber stoppers and flip caps. Please note that each vase is unique and therefore the pattern on the vase may vary from the photograph above.